This article originally appeared on Christian Personal Finance. Used with permission. Imagine my chagrin when I overheard this conversation. Daddy: I need a job done. I’ll pay you a dollar. Daddy: You have to promise you’ll spend the dollar. I share this cute story to say that everyone’s approach to what they do with their money needs a balance. And nothing helps that balanced approach more than responsibility. The nine-year-old doesn’t have a regular income, so we haven’t required him to meet any financial responsibilities. But our teens are a different story. 1. Pay room and board. Once our teens have a regular job, we require them to help out with the home expenses. Doing so teaches them responsibility. This can be different for different kids. One son might voluntarily stop by the store and pick up whatever he notices is missing from the pantry. On payday, he may come home with a couple bags of groceries. That boy doesn’t need a parent sticking out a hand asking for room and board money. However, another child might need to be reminded what to do with her paycheck each week. She might rather shop till she drops – for trifles – than help daddy pay the electric bill. How a family implements this custom would depend a lot on the family’s dynamics and the temperament of the teens involved. 2. Pay their own expenses. We do not pay for our children’s driver’s education courses, buy them cars, put gas in them, or pay for the insurance. As parents, we believe that driving is a privilege that must be earned. The same goes for cell phones. Our teenagers pay their own vehicle and phone expenses. This practice, too, teaches them responsibility. I have always required my teenagers to put 50 percent of their paychecks into a long-term savings account. This money is set aside for one of three things: college expenses, to purchase a home or piece of property, or to start a business. This money is not for buying a vehicle, Christmas gifts, new clothes, or anything else. It is for their future. Since my husband taught the boys how to scrap metal over 20 years ago, all our kids have found different ways to make an income. Sometimes, these entrepreneurial ventures require a bit of start-up capital. When the oldest was 14, he worked dipping ice cream for a full summer to pay for his first anvil. After finishing his blacksmith apprenticeship program, that anvil earned him back the money many times over when he sold his hand-forged items in local gift shops. Teenagers have a lot of needs. As we’ve already discussed, they need to keep their gas tanks full, cell phones connected, and save money for their education. When you’re working a minimum-wage job, there’s not a lot left over — so the temptation is to spend it on oneself. After all, everyone else is wearing batik scarves or Macbeth footwear. But the scripture teaches that God loves a cheerful giver. Hopefully, we’ve instilled the concept of giving in our children long before their teen years so that this is not such a heart-wrenching issue. Besides giving to the local church, our kids have helped to sponsor children through Compassion, supported their older brother on the mission field, or just generously given whenever a need was made known. Every family is different. 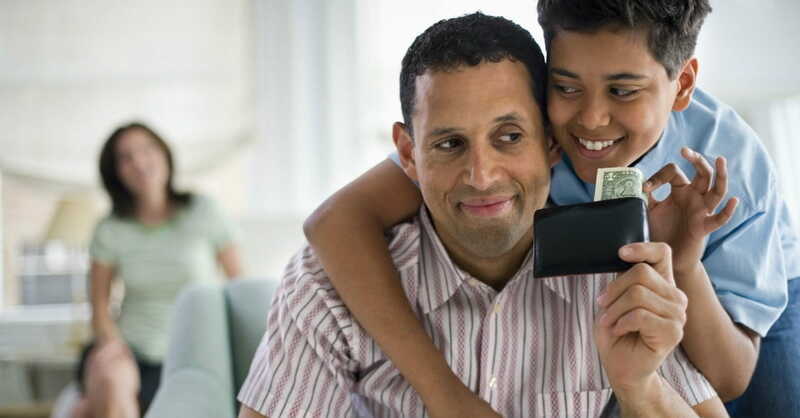 These principles have worked for our family, but I’m sure that you could come up with five different ways you would like to see your teenager spending their money. I’m open to discussion, so why not share in the comments! Carol lives in a world of Homesteading, Homemaking, and Homeschooling. Read more from her at EverythingHomeWithCarol.com. Christian Personal Finance is a resource dedicated to building God's Kingdom and helping others through money.